Below are placemats with Western designs for sale. A placemat (sometimes spelled as two words: "place mat") is a small mat beneath an individual place setting (plate, napkin, utensils, drink ware, etc.) at a dining table. Their purpose is to protect the table (and tablecloth, if one is being used) from food and liquid stains, as well as general wear and tear. While they definitely serve a practical purpose, their other main function is to serve as decoration: The right placemats can add a finished look to any table setting. Below are Western placemats for sale from Zazzle, Amazon, and eBay. You might also like: Cowboy Placemats or Western Table Runners. Below: A leather-look Western placemat from Zazzle. Construction materials on Western placemats on Zazzle DO vary: Some are cloth, others are laminate, and some are made from paper for throw-away or recycling ease. (Note: While some of the details such as leather, conchos, etc., on placemats from Zazzle can look very real, especially in the photos, they don't actually contain any of these materials.) When on the Zazzle website look below the main image preview for the "About This Product" area to read about the size, construction, and care of any particular placemat you're interested in. eBay usually has an excellent selection of Western placemats for sale. So, What Is A Placemat? To understand what a placemat is, it's first useful to know what a "place setting" is. A place setting is made up of the plate(s), utensils, drink ware, and napkin used by an individual person at a meal. Place settings can be informal or formal. A placemat, then, is a mat placed beneath an individual place setting. Placemats can be used alone (that is, placed directly on the table) or in addition to a tablecloth. Either way, they serve the purpose of protecting the table and/or tablecloth from dining hazards such as spills, stains, and regular wear and tear. Additionally, placemats are decorative and can add a beautiful accent to any dining table, whether it be for a casual meal or a more formal one. 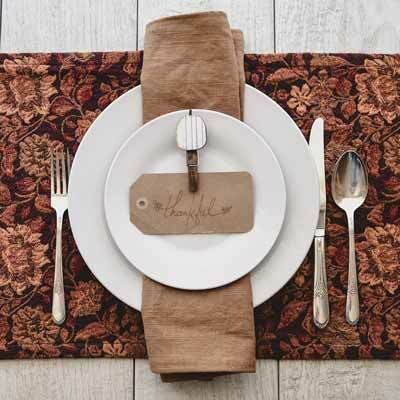 Below: A beautiful placemat underneath a place setting on a wooden table. Above: CC0 image courtesy of Pixabay.com. Placemats can be, and are, made from a wide variety of materials. While many of them are easy to care for (they are, after all, the first one to "take a hit" if a dining accident should happen), some of them are made from materials that can't simply be wiped with a damp cloth or thrown into the washer. When shopping for placemats, be sure to read the care instructions on any placemats you might be interested in as care instructions do vary.